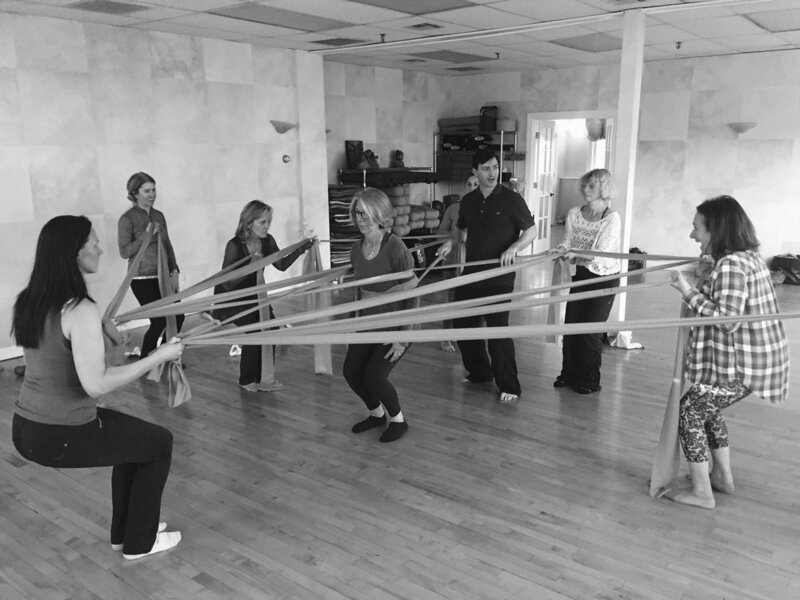 This weekend is meant for Franklin Method Educators, who have completed at least Level 1 training or one of the modular trainings. As a way of providing support and building community, this time is an intensive dive into the practice of teaching FM as well as the way in which we use in daily for ourselves to become better teachers. Together, we'll address burning questions you have within the classroom or personal practice, as well as examine methods of aiding students in connecting to the work through our own embodiment. The cost of this weekend is by sliding scale ($100-$250) -- please consider what you are able to contribute toward food, accommodations, and guidance. If you are in position to aid in covering costs for others, it is greatly appreciated. Please bring your own FM balls and band! Accommodations are included: rustic but comfortable, and communal in nature. 4 raised platform tents can house up to 12 people, and include beds, sitting area, small wood stove, and beautiful views! There are shared outdoor bathrooms and shower facilities. If you prefer to stay in the house, there are limited rooms available to rent, as well as nearby Airbnb and hotel options. Please include any accessibility information we need to know at application, so that we can discuss and accommodate. Food will be is provided from local farms and includes 2 breakfasts, 2 lunches, 2 dinners. Participants will cook, clean, and break bread together. Please be sure to include any dietary restrictions in your application. Payment is due upon receipt of PayPal invoices sent to the email provided, which will include a 3% processing fee charged by the service. Checks must be received to Succurro within a week of application to hold your spot. Please consider carefully what you can afford for accommodations, food, and guidance. If you are in a position to help subsidize attendance for others, please choose the 'Support' option. Thank you! We look forward to seeing you in October. Please let us know if you have any questions, and we will be in touch with a payment invoice if needed.